A great product to keep moms and dads hands free! 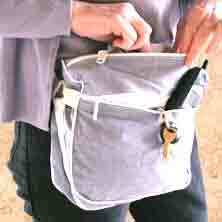 This works like a fanny pack, but will hold more items. There is room for a cell phone, car keys, billfold, sunglasses, diapers and wipes. The Hip Helper Diaper Bag is washable, lined, water resistant, and contains two zipper pockets. The waist strap is adjustable. If you prefer not to wear it around your waist, it can be attached around the Sling Ezee while you are wearing your baby to stay hands free, or it can be used as a shoulder strap. Breastfeeding moms do not have the need to tag along large bulky diaper bags since formula isn't needed. This is perfect for outings with your baby. Hip Helper Diaper Bag is only available in Chambray, Paisley, and pink dot. If you are ordering outside the US, please email for shipping cost. I can invoice the amount for you to pay online or you can add the extra shipping increments at the bottom of the catalog page. Please understand that some countries will charge you importing fees or taxes and those cost are unknown to us.